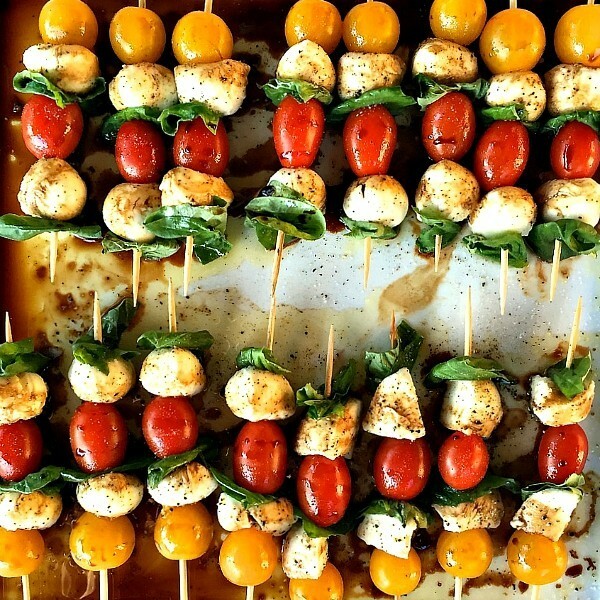 Mini Caprese Skewers are a light, quick appetizer, drizzled with your favorite olive oil and balsamic vinegar! reat for any party! My girlfriends were coming for a quick last-minute dinner. It was too cold to eat outside, so I set the table and pulled a simple meal together quickly, asking my friend Cindy to bring a salad, My friend Judy brought this Mini Caprese Skewers Appetizer! Which, by the way, I loved Judy’s tip on buying bulk 8″ bamboo skewers online! If you love to entertain, this is definitely the way to go! 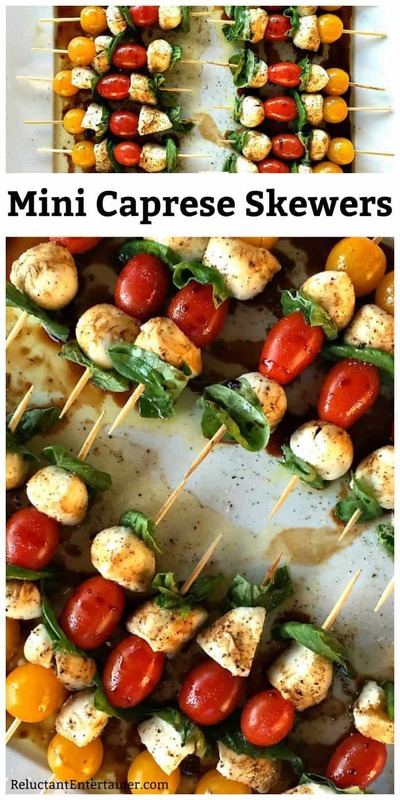 We really enjoyed these Mini Caprese Skewers appetizer! This appetizer is best if made with a premium balsamic vinegar. Do a little reseach online for the best. When the last skewer was picked up, we were dipping our fingers into the glaze left on the dish. They were that good! When I host friends for dinner (usually when my hubby is out of town), I like to change up the guest list, the menu, and try to invite someone new! This time I invited 2 friends who’ve never been to my house. We had such a lovely time. I love creating a setting, the mood, the atmosphere (music, candles, warm ambience). It’s a place for others to connect and really get to know each another. It doesn’t have to always be a dinner party, but for me, I find the “actual table” experience is really where it’s at. It’s good to really think about your intentions in bringing others together. For me, a very busy person (as are all my friends), it’s a few precious hours that can be very meaningful. 1. If you don’t have the table set, having everyone sit together, then 2 or 3 people may end up talking together the entire evening, not mingling with others. 2. The table is the place where everyone gets to contribute, and everyone listens. For the introvert person, this is extremly important. 3. For someone shy or new, the table is a safe place to not have to talk much (listening in! ), but still get to know others. 4. The host can ask questions and keep the conversation flowing in a positive and meaningful way. 5. The host can go around the table and ask questions, to get everyone involved. 6. You can still plan a casual buffet, having everyone serve themselves, then bringing their dish back to the table. 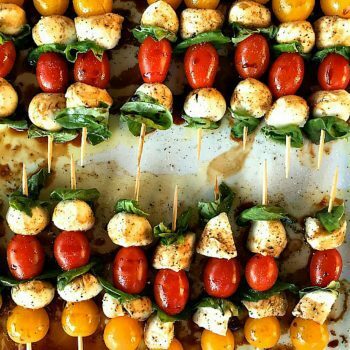 So whether serving this recipe as an appetizer or a sald, either way these caprese salad skewers are a big party hit! Also try Hot Caprese Dip Recipe [Rachel Cooks] or my Caprese Chicken Casserole Recipe or Pesto Asparagus Caprese Salad (so good) or Easy Dill Pickle Dip [That Skinny Chick Can Bake]. 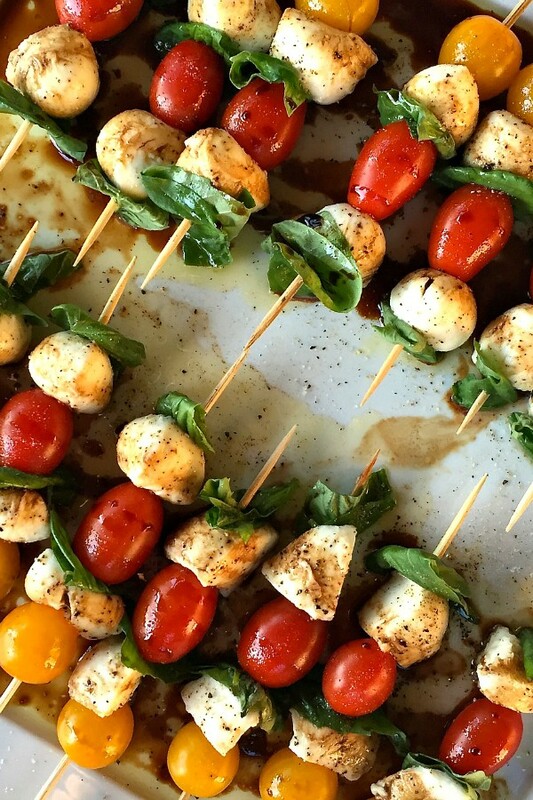 Mini Caprese Skewers are a light, quick appetizer to serve at a dinner party, or to bring to a picnic or potluck. 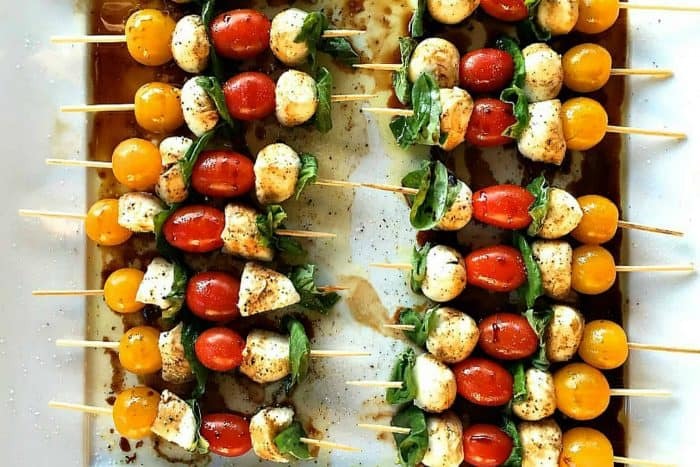 Great for any season, caprese salad skewers can be served as an appetizer or a salad, drizzled with your favorite olive oil and balsamic vinegar! Wash and dry the cherry tomatoes. Pierce one tomato on each skewer and lay them out on a plate. Next, push one chunk of mozzarella on top of the tomato, and place a basil leaf on top. Repeat the process until there are 6 pieces on each skewer. Lay each Caprese Bite in a row, on a platter. Drizzle with olive oil, balsamic vinegar, and salt and pepper the skewers. Serve! 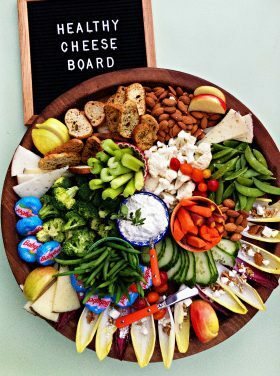 Appetizers Casual Parties Conversation Entertaining Gluten-Free Hospitality Introvert/Extrovert Parties Recipes Relationships Setting the Table Snacks Vegetarian Why Reluctant? Yes, but if you add a balsamic glaze, do that right before serving! 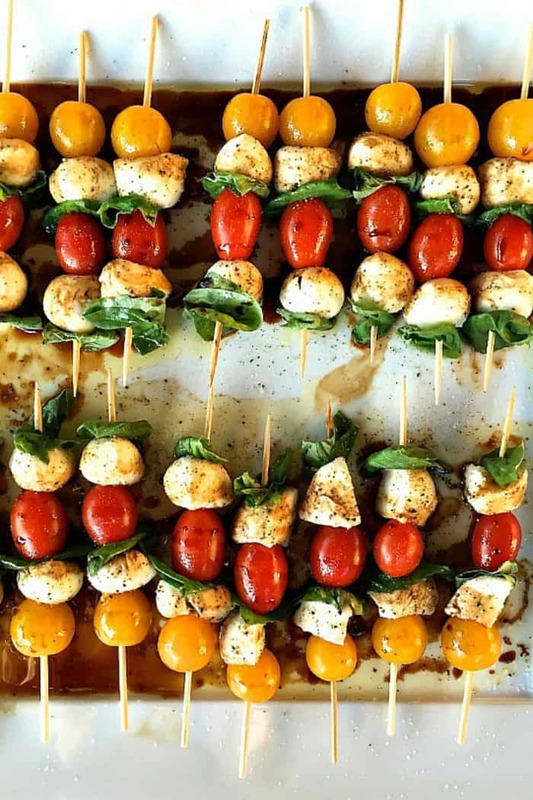 I love Caprese anything and these skewers look fabulous! 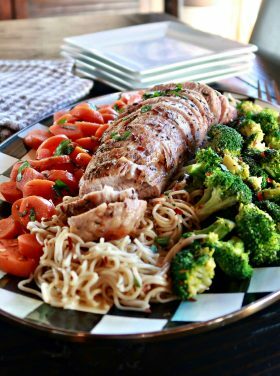 Perfect for easy summer entertaining!!! Love what I found on Pinterest! Pls add me to. Your blog. I love the conversations that go around the table…sometimes everyone involved in one conversation, sometimes a few conversations going on at the same time. And sometimes it’s fun to just sit back and listen to all of them going on and not say a word. Love these! The – skewer “salad on a stick” idea… works so wonderfully and so easy. The one thing I remember most about my mother was that she loved nothing more than to cook a meal on Sunday after church and to bring her family together around her dining room table. Our family grew, so it carried over into the den with tv trays. But, it was a time when we all came together and shared our lives with one another. I’m carrying on this tradition with my family now. Precious words your friend spoke and so true. 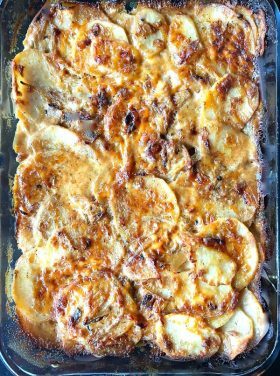 Love this recipe and can’t wait to plant my fresh basil this summer and try this lovely recipe out! You are an inspiration to me to open up my home and show others God’s love through me! On last thing I forgot the recipe looks great, super easy for some reason I have it my head that appetizers are too hard or complicated to make. Always great to here about delegating I enjoy seeing what other people bring I think it adds to the meal. I enjoy getting to know others more deeply as we gather around the table. Absolutely loved what you shared on here today and the bit from your friend was priceless!!! Thanks Sandy you truly do bless us as you minister to us through RE!!! Now that we are an hour away from family (almost my whole life I’ve been minutes from family) I just love seeing my family. All of us talking and laughing and being together.